World Bank’s Global Findex 2017 showed that 79% of the Indian population held bank accounts – but the figure for Indian females over the age of 15 was 77% as opposed to 83% among Indian men. This represents a significant improvement from the last round of data (prepared in 2014) in which account opening was at 53% across the country, and the figure for Indian females was only 43% relative to 63% for Indian men. But with account ownership increasing across India, is the existing banking infrastructure capable of substantively improving access to financial services among women? 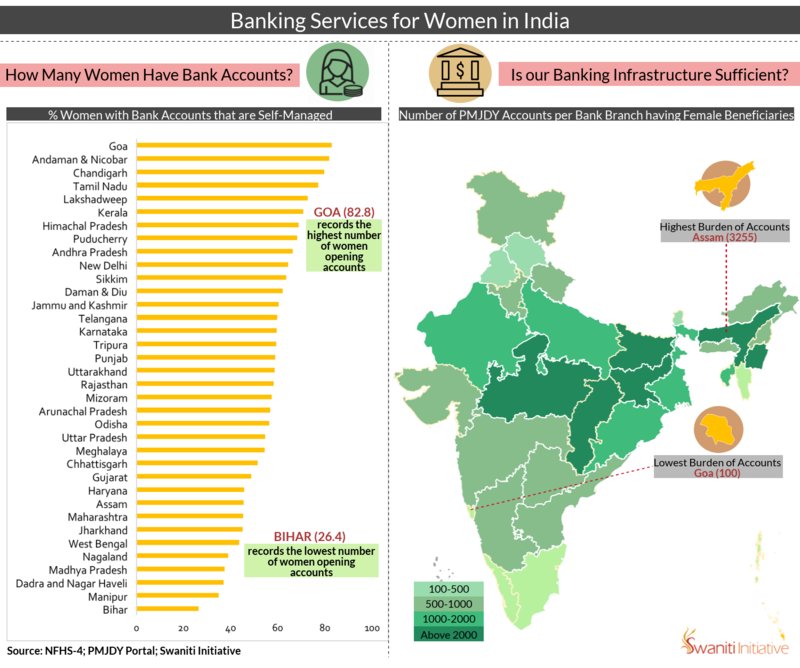 In this pictograph, we have analyzed the state wise access to bank accounts for women and consequently assessed the banking infrastructure with respect to the increased banking operations under Pradhan Mantri Jan Dhan Yojana (PMJDY). This helps give a picture of how far the existing infrastructure in each state can support financial inclusion initiatives aimed at women. As per NFHS-4 data from 2015-16, women in each state were asked whether they had a bank account that they themselves managed for savings, credit and to access financial services. As shown in the first infographic panel, these figures ranged from Goa in which 82.8% of women responded positively, to Bihar where only 26.4 of women did the same.The wide variation across states reflected that even as the absolute number of women with bank accounts had increased, active account use and self-management remained much lower, with the pan-India rate reported as 53%. In addition, in eleven states this number continues to remain below 50%. Under Pradhan Mantri Jan Dhan Yojana (PMJDY), all households in the country are to be brought under the banking infrastructure through the process of each household having access to at least one bank account. These accounts can be opened under the name of any member of the households. With the increase in number of PMJDY accounts opened for female beneficiaries, existing infrastructure is under stress.The second infographic panel depicts the burden from such account holders i.e. average number of accounts with female beneficiaries opened per bank branch in the state. A greater burden in a state indicates a larger challenge in converting bank account holders to active users.The state with the lowest burden is Goa, with 67,586 accounts under female beneficiaries and 678 bank branches (creating a burden of 100 accounts per branch). The state with the highest such burden is Assam, with 75,73,098 female beneficiaries and 2,326 bank branches (a burden of 3,255 accounts per branch). Other states with a burden greater than 2000are Chhattisgarh, Bihar, Manipur, Madhya Pradesh and Jharkhand. While access to accounts has been significantly extended in recent years, the gains have not translated to putting women directly in charge of their financial situation. Therefore, in states where the percentage of women who manage their own accounts is very low and burden on infrastructure is high such as Bihar, Manipur, Madhya Pradesh, West Bengal and Assam, there is a long way to go in achieving the goals of Financial Inclusion for women.